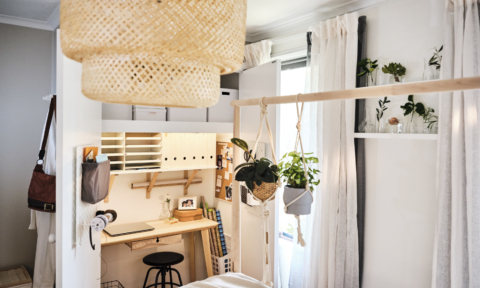 With most of Australia’s population scattered around our vast shoreline, it figures that the beach forms a significant part of the Australian psyche, and thus our interiors. 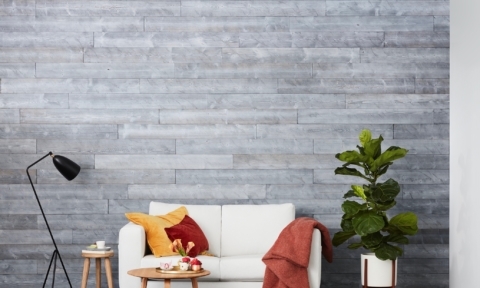 From inside living spaces that flow seamlessly to the outdoors, to outdoor showers designed to rinse off beach sand, the coast informs our interior choices in ways that we possibly don’t even realise. We also have a distinctive and inspiring Australian beachside aesthetic that is markedly different in tone to other parts of the globe. 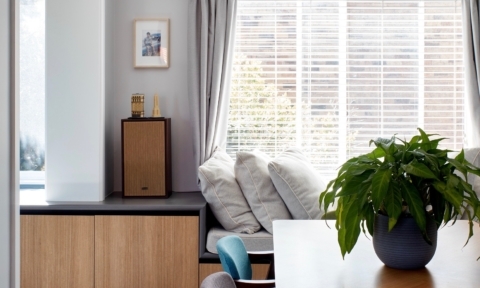 “A quintessential Australian interior is always beautiful but never precious. 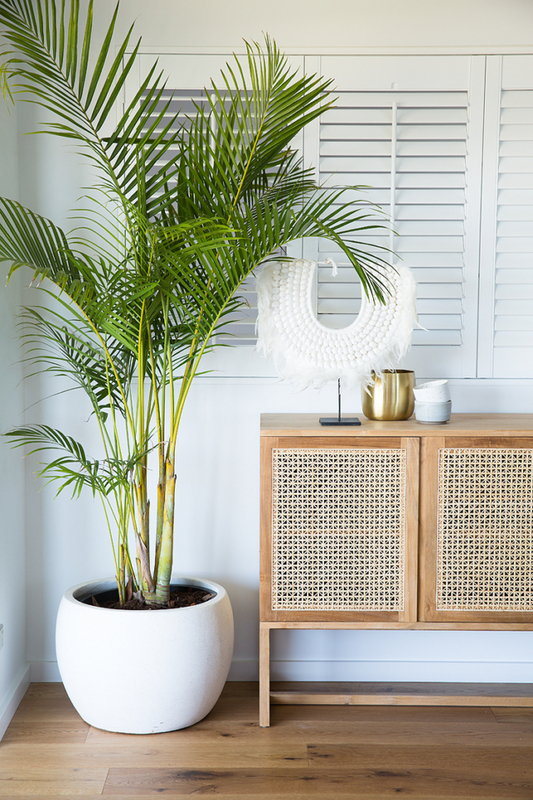 From a super laid back beach shack aesthetic to a more luxury take on coastal, an uncontrived earthiness and our connection with the outdoors is what sets us apart from coastal aesthetics in other parts of the world. We appreciate less formal settings (not to be mistaken for lower quality) than our American counter-parts for example, where Hamptons is a formal coastal style all about grandeur and luxury,” says Tess Beagley of Minted Design. But how do you create this style while avoiding the clichés? “If you’re an Australian reading this, I’m pretty certain you would’ve stepped into many a cliché coastal interior. That ‘Beach Shack’ sign hanging on the door, the glass bowls full of shells, the lighthouse figurine, maybe even, dare I say it, a dolphin duvet cover. We’ve all seen it go horribly wrong,” says Tess who recommends avoiding coastal symbols and decorating choices that are too literal. 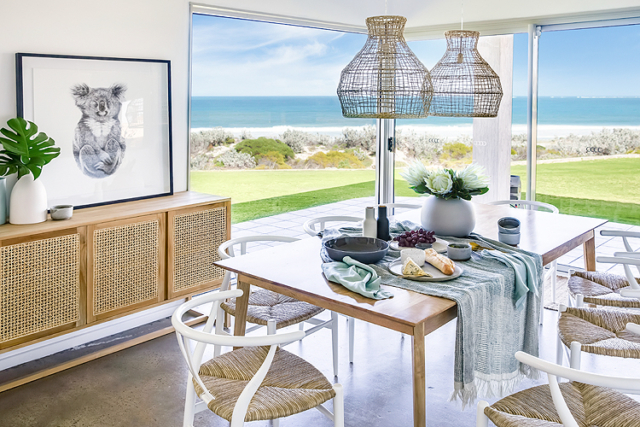 “Instead opt for subtle nods to the coastal style like a contemporary coastal landscape print, woven baskets, beautiful ceramics in ocean inspired hues, textured natural wall hangings and furniture made from high quality natural materials like timber and rattan. 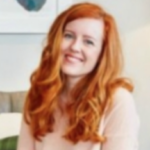 Concentrate on creating a ‘feeling’ with colour and material choices, rather than collecting endless amounts of cheap decor that scream ‘beach,’” says Tess. 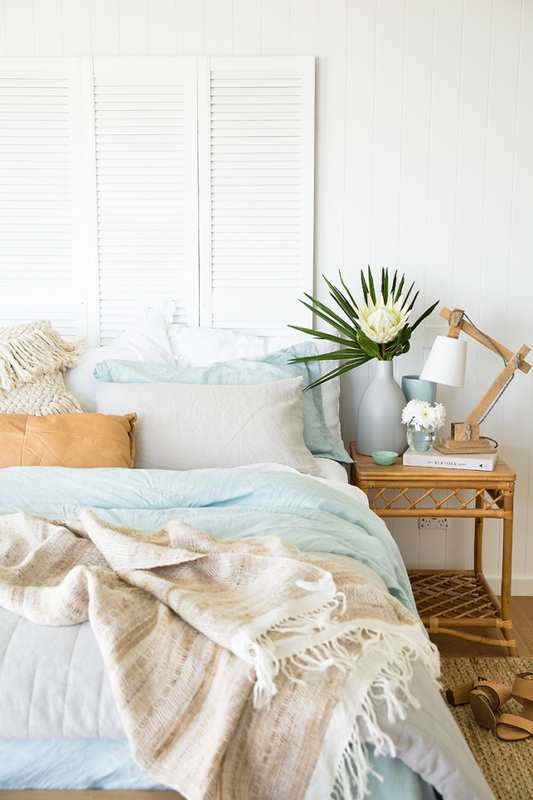 “The best interiors conjure a feeling, so focus on creating a breezy coastal ‘vibe’ rather than getting hung up on decor and furnishings that are too seaside literal like glass bowls of shells or too much driftwood,” says Tess. 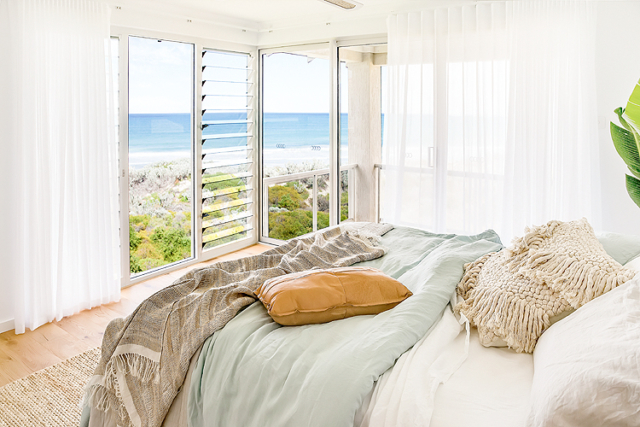 “We have incredible natural light here in Australia and our coastal regions also offer an abundance of rugged wind and soft breezes. 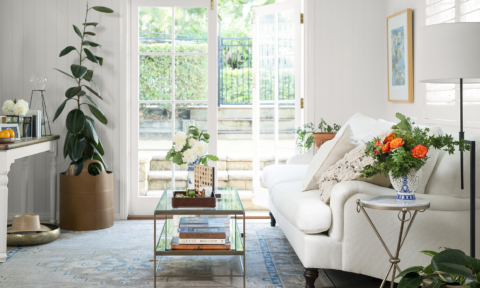 Make the most of it by encouraging as much natural light as possible – use a white or neutral colour base for your interior and then choose fabrics and textures that will move with the breeze like light white sheers on the windows and tasselled throws. These choices help to showcase our amazing light and wind, creating movement indoors and inspiring that breezy coastal feeling,” says Tess. 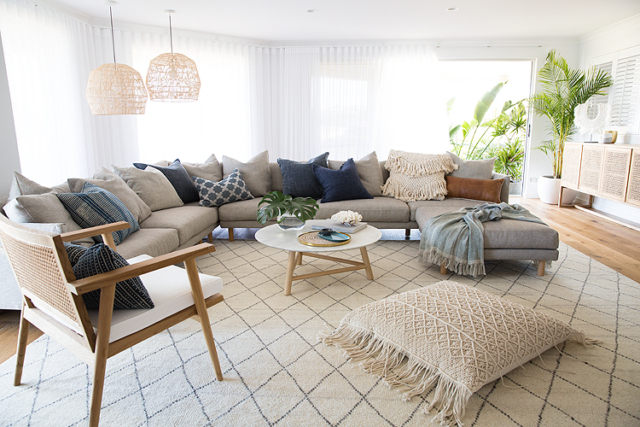 “A typical Australian coastal interior features white walls, timber flooring and then builds on the neutral scheme with textured yet grounded and unpretentious fabrics and materials like jute, linen, rattan, leather, timber, raw stone, and merino wool. 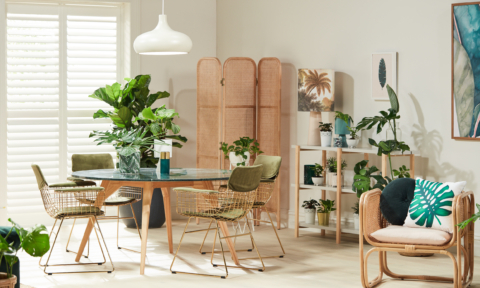 In addition, you would usually add a small amount of coastal landscape inspired colours, as pops of interest against the neutral and natural palette,” says Tess who recommends starting with a base of timber flooring, cladded white walls and pops of greenery. 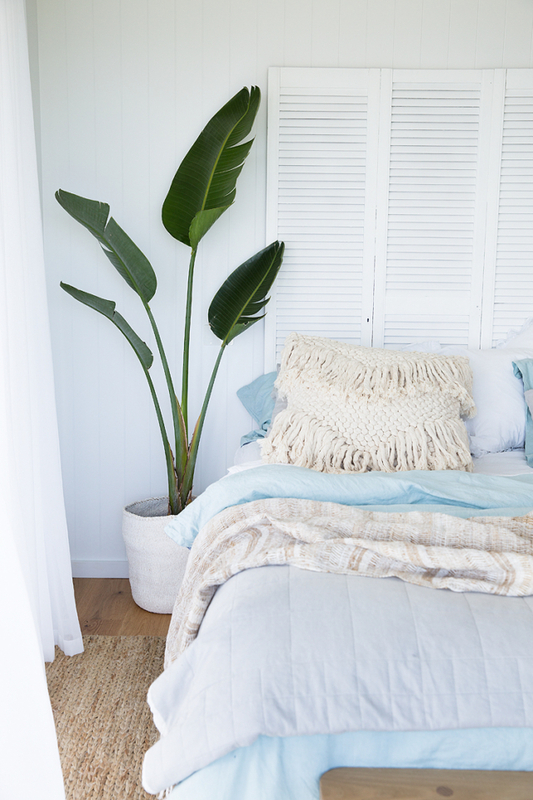 “No interior is complete without greenery so use plant life to give your place that beachside retreat vibe,” says Tess. “Perhaps you’d like a hammock to plonk yourself in on a Sunday afternoon, some woven baskets under a timber bench seat to take off and store your shoes next to the front door, some timber hooks on the front veranda to hang your beach towels after a swim, or some relaxed timber and rattan occasional chairs paired with a leather ottoman to create a relaxed beach-boho styled space to chill out in on a Saturday afternoon after a big morning at the beach,” says Tess. 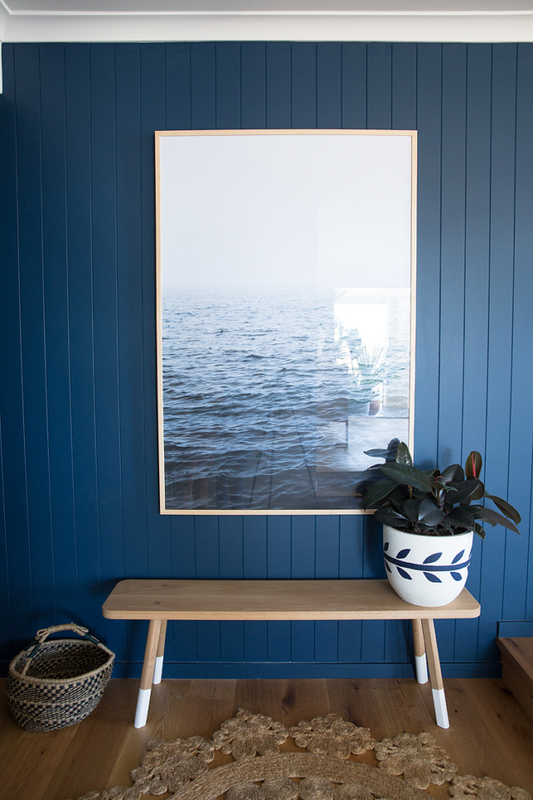 “When channelling a ‘relaxed/casual’ aesthetic associated with coastal interiors, it’s easy to over decorate your space with cheaper items and furniture which seem to fit the coastal brief. This is always a mistake, so make sure you focus on fewer higher quality pieces. A beautiful quality piece like a well-made armchair in a contemporary design and a coastal inspired material like rattan or cane, can bring an unrivalled sense of integrity and coastal character to your space, so wherever possible never overlook these high-quality pieces for a cheaper price tag,” says Tess who believes that high quality furniture is better equipped to withstand the wear and tear of sand, water and outdoor life too. 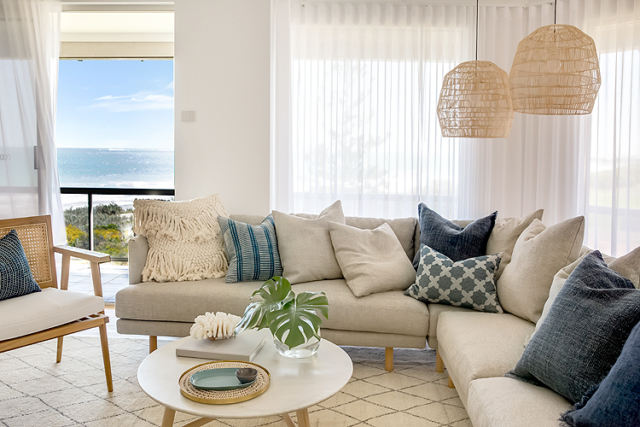 So many cushions on that modular lounge..
Love a relaxed beach style, mixed with brightness of Hamptons…the white is refreshing. 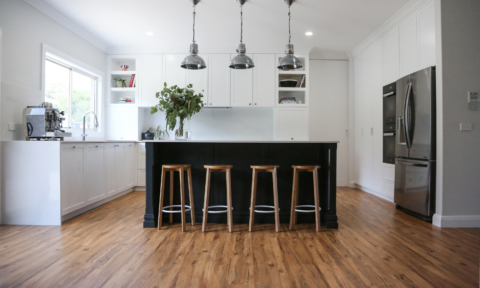 We can create the best of both for an Aussie home. This is beautiful! And looks like many American homes. 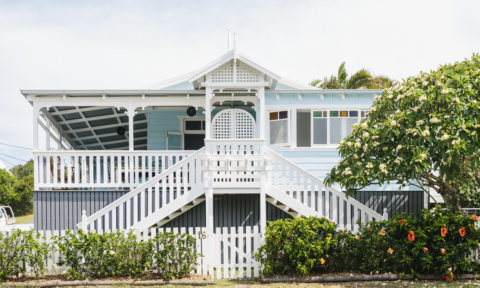 I don’t really think Australian beach living is all that different from many laid-back American casual, but refined homes. They are all beautiful and offer comfortable living.